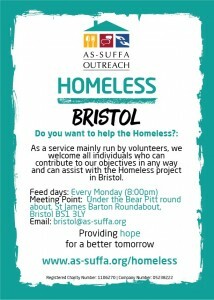 In the heart of Bristol, we have set up a new project serving every Monday between 8pm – 9pm. This is the 8th project that has started under As-Suffa and it’s at a very early stage. Please watch this space for regular updates.